With holiday season 2018 in full swing, now is the time to get started on those holiday lighting ideas. Decorating the outside of your home can be a fun family experience that transforms your property into a lit up, glistening Winter wonderland. With options ranging from mini incandescent, LED, icicle lights and dancing holiday displays, your home will be well on its way to standing out among the brightest and best on the block. Choosing the focal point of your holiday light display is the first step in planning your winter light show. A natural choice for the focal point of your scenery is your home. Your home is the eye-catching focal point that will immediately draw eyes, before slowly taking in the surrounding landscape. You may also consider illuminating key windows, your garage, and the front door. 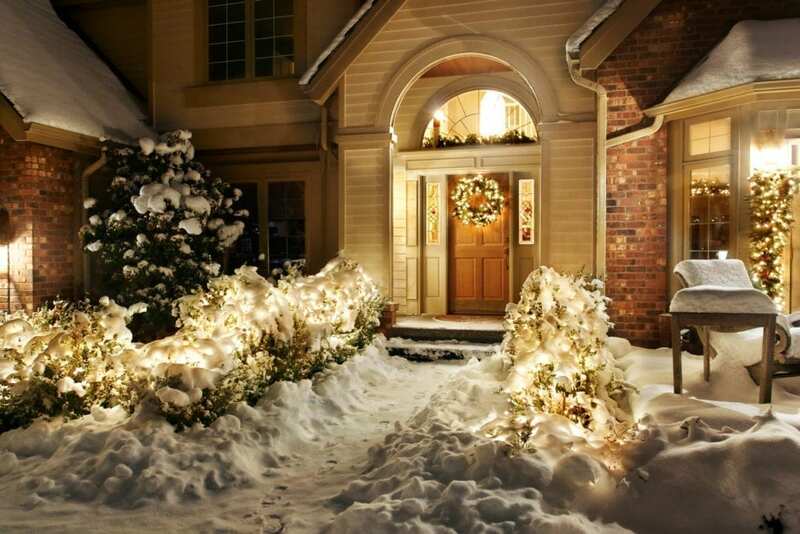 Not to be overshadowed, illuminating pathways leading to the focal point of your home and elsewhere is key in tying your holiday lighting effect together for maximum results. Sidewalks leading to your front door or around your property can be illuminated with mini LED lights that offer maximum glow with energy efficient power. Moving onto the perimeters of your home, outlining your yard and driveway is an excellent way to stand out on the block. Lighting pathways will not only illuminate your property with a festive glow, but it also provides a brightly lit path for guests to navigate. Another way to make your property easier to navigate on those icy sidewalks, illuminating your shrubs and bushes with LED lights is a popular method to achieve your brightest glow. Before placing lights on trees and bushes, take a mental inventory of the image you’d like to achieve. It may be useful to take photographs of your home and landscape to gain an accurate impression of your current yard, then develop a plan based on the purpose you wish to achieve with your light display. In most cases, it isn’t necessary to illuminate every bush or shrub outside of your home. Formulating a strategy to illuminate perimeter bushes along with one or two larger in size is often sufficient in achieving your purpose. Accenting the unique architecture of your home will help you stand out among the crowd and tie in nicely with the illumination of your bushes and shrubs. Focusing on detailing, clocks, doorbells and other features unique to your home will complete the illumination effect and tie everything together seamlessly. Even the best holiday light displays can be subject to the effects of overkill. Avoid going overboard when lighting your home by following a plan that includes a clear focal point, selective illumination of walkways and paths and the right accent methods for your architecture. Hire a Professional to expertly illuminate your home this year can further help you to avoid holiday mishaps.